If Bipan Chandra – the Marxist, Nationalist, Gandhian, Liberal, all rolled into one – did not exist, he would have to be invented. His life, both as a teacher and historian, is so crucial for us to have a sense of our current accomplishments and predicaments. His life is a parable of five decades of historical thoughts on modern India. However as luck would have it, Bipan Chandra did exist, in flesh and blood, till 30 August 2014 at any rate. So there is no need to invent him. All that needs to be done is to tell his story, a brief intellectual biography. Bipan Chandra was a historian of modern India. He wrote mostly in the five decades from 1960s till 2000s. His works were addressed to three different phases of Indian history – late 19th century, the early decades of the 20th century till independence, and independent India. He wrote scholarly pieces, essays at popular level and school textbooks. Through his writings he addressed an amazingly large and diverse audience. He was around 15 books and many articles old. 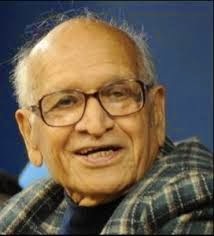 He taught Indian history to many generations, firstly in Hindu College, then in Delhi University and finally in the new Jawaharlal Nehru University (JNU) where he taught till he retired in 1993 and became a professor emeritus. As a historian, Bipan made his contribution in different themes and sub-themes of modern Indian History. In each sub-theme his contribution was in the nature of an intervention. It provoked a dialogue and often a chain of responses. Around five of such interventions deserve mention here. 1. Economic Nationalism: When Bipan did his Ph.D on the economic ideas of the 19th century political leaders (which was subsequently published as a book The Rise and Growth of Economic Nationalism in India in 1966), the dominant view of the moderate leaders was that they were petitioners and collaborators. The historical writings just stopped short of calling them loyalists. Bipan spent five years of rigorous research to demonstrate how false these ideas were. He demonstrated that the 19th century leaders such as Dadabhai Naoroji, Ranade, Gokhale, Tilak, R.C.Dutt and many others prepared a comprehensive economic critique of the British rule. They delineated the functioning of the Colonial rule – Drain of wealth, heavy taxation of the peasantry, Home Charges, imperialism of free trade, the uneconomic spending done on maintaining a large army, unfavourable pattern of foreign trade, destruction of traditional handicrafts (though they did not use the word ‘De-industrialization’; that happened later in the 1940s), and obstructing the modern industrial development of India. All these were the axial elements in India’s relationship with Great Britain. In other words, the 19th century leadership provided a minute and a comprehensive understanding of the functioning of imperialism and the motives behind it. And all this happened a few decades before Hobson, Hilferding and Lenin gave us the theory of imperialism. Bipan also highlighted that among the intellectuals in various colonies, Indians were probably the first to subject the alien imperial rule to such rigorous scrutiny. Thus came a new concept ‘economic nationalism’ and was applied to 19th century India. It implied the role of economic ideas in feeding into Indian nationalism. On the scale of acceptability, the thesis of economic nationalism was welcomed and accepted readily by the community of scholars. It was developed subsequently but not critiqued or dismissed in India. Economic nationalism was one of the more uncontentious ideas that have emanated from Bipan’s pen. Some other ideas were not so lucky and many of them were subsequently contested. But contentious or consensual, Bipan’s ideas could never be ignored and set the stage for stimulating debates. 2. Gandhi: This was yet another major intervention from Bipan that was not very contentious. Till very late in his life, Bipan did not write any monograph or even an article on Gandhi. May be he was waiting to grow older so as to truly appreciate Gandhi’s politics and personality. But he had begun talking and discussing Gandhi a great deal since the 1980s onwards. Till then the general understanding of Gandhi lacked depth. The Left had not gone beyond R.P.Dutt’s characterization of Gandhi as a leader of the Bourgeoisie. In the non-Left circles, Gandhi was generally understood in terms of austerity, village economy, Brahmacharya (celibacy) and spinning. The Gandhians had begun deifying him as a saint and a semi-god. In short, plenty of mist had gathered around Gandhi, so as to make him invisible and unintelligible. And this mist came from diverse sources. Bipan did not directly engage with these positions, but constructed a picture of Gandhi which was different from all of these. He looked at Gandhi primarily as a strategist. Gandhi’s main role in the nationalist movement was not just to lead the struggle but also to create a strategic framework within which the struggle was to be fought. People missed out this aspect of Gandhi’s politics because Gandhi never consciously theorized his strategy. It existed in a diffuse form, scattered through his writings and activities. The strategy had therefore to be extrapolated, by the historian. Gandhi’s strategy existed but in an uncategorized form. Bipan demonstrated that this strategy existed; that there was enough evidence for it; and that it had just not been imagined into existence by the historian. The strategy was as follows: The British did not rule India by naked force. They ruled India by creating a support system and by trying to capture the minds and hearts of Indian people. In other words, they ruled India and Indians through hegemonic control. They were therefore to be expelled by eroding this hegemony and by establishing the counter-hegemony of the nationalist movement. In other words, it was not necessary to defeat the British but to make it impossible for them to stay in India as rulers. If Indians stopped supporting the British rule, there was no way in which British imperialism could remain in India. The British did not need a push, but only a withdrawal of support and cooperation from people in India. This was the broad picture. Bipan also provided the details, the veins and arteries of Gandhi’s strategy against British imperialism (Indian National Movement: The Long-Term Dynamics, presidential address at the Indian History Congress, 1985). This indeed was a new view of Gandhi. Bipan’s Gandhi was not the Gandhi of Hind Swaraj (a book Gandhi wrote in 1909, prior to his involvement with the nationalist movement), an uncompromising enemy of Modernity. He was also not some otherworldly transcendental saint. Nor was he a scheming politician and a power-broker. Bipan’s Gandhi was a constantly growing political leader who was transforming politics around him, even as he was being transformed by it. This Gandhi was not card-board figure. He was human, albeit an exceptional and unique one. Bipan’s ideas on Gandhi would not be considered consensual, even though they did not quite provoke adversarial reactions, as some of his other ideas did, namely the ones on communalism and on the Left. a) It debunked any naturalization of communalism in India, a favourite theme in some of the sociological writings from the US, which saw this as natural in all modernizing societies. ‘Ethnicity’ and ‘ethnic conflict’ became the generic terms to identify all such phenomena. As against this Bipan argued that communalism was not naturally a part of Indian society and politics. It was a product of social conditioning. Given as alternative set of social conditioning, it might well have not emerged. Likewise, given a different set of social conditions, it should be possible to get rid of communalism. If communalization of Indian society was a possibility, so should be a de-communalisation of Indian society. b) It argued that Communalism was not a hang-over of India’s medieval past. It was not the mere presence of Hindus and Muslims against each other that produced Hindu and Muslim communalism, respectively. Communalism was a modern, 19th century phenomenon and a product of the new socio-economic forces unleashed by the British imperialism. Both these inputs were important and were accepted without much fuss. What however provoked adversarial reactions was his characterization of communalism as a ‘false consciousness’. This was really critiqued by many. One historian wrote in an article published in the EPW (I quote from memory): “Historians will go on dismissing communalism as a false consciousness. And yet it will go on increasing.” This was an extra-ordinary statement and based on a complete misreading of the generic idea of false consciousness and the manner in which Bipan applied it to communalism. Bipan did not use ‘false’ as against ‘real’. He did not dismiss communalism. He did not consider it unreal or non-existent. Far from it. You do not write a whole book on things which, according to you, do not really exist. Bipan considered communalism false in the sense that it was not a natural or an organic outgrowth of Indian society and history, but only its distorted manifestation. He fully recognized the ‘reality’ of communalism and considered communal ideas as extremely powerful. It is certainly possible for false ideas to become powerful and acquire a hold on peoples’ minds and hearts. But for that very reason, they don’t become genuine. It is in this sense that it is quite possible for some ideas to be powerful and false at the same time. I might add here that it should still be possible to disagree with Bipan’s characterization of communal consciousness as a false consciousness. But one must understand his thesis correctly before disagreeing with it. As Bipan would himself say: “Even the incorrect positions have got to be understood correctly.” By this I do not mean to suggest that Bipan’s characterization in his book was incorrect. I am only highlighting that some of his ideas were misconstrued and it was the misconstrued version that was repudiated. I am personally of the view that Communalism in Modern India is his most under-rated book. It is the most theoretical work he produced. It combined a grand sweep with minute details. It was one of the very few attempts to produce a fully rounded, well worked out theory of communalism. The book also highlighted the functioning of communal politics. The theory was not simply stated, but also empirically demonstrated. The book had the big picture and also the minute details. In other words, it supplied both the telescopic and the microscopic view. While conceptualizing the book Bipan had made good use of authoritative works on Fascism in European history and also the contributions of Indian Marxist scholars (R.P.Dutt, K.B.Krishna, W.C.Smith, Jawaharlal Nehru, K.M.Ashraf) made in the 1930s and 40s. To this day, it remains the most structured and comprehensive explanation (and not simply a description) for the emergence of communalism in Indian politics. 4. Left in Indian Politics: Perhaps the most contentious ideas to have emanated from Bipan’s pen were the ones pertaining to Indian Left. He received the maximum flak for his criticism of the Left during the nationalist movement and of the official Left in independent India. Bipan had been a member of the undivided Communist Party of India but did not renew his membership after the split. I think his view of the Left as it developed in the 1970s was being shaped by three different factors: i) His disillusionment with the politics of the official Left both at the national level and in JNU where he taught; ii) His evaluation of the Congress as a historical necessity for the Indian society. This inevitably distanced him from official Left; and iii) A slight diminution in reliance on Marxian categories of analysis (particularly from 1970s onwards) and a search for supplementary (not necessarily alternative) paradigms for understanding the nationalist movement. “They [Indian Communists] have many an achievement to their credit which should not be ignored. One need not therefore be carried away by the ‘twisted’ dictum: nothing fails like failure. 1. Against heavy odds and facing the full repression of the colonial State and the ideological opposition of both the traditionalists and the modern bourgeois political leadership and intellectuals, the Indian Marxists succeeded in popularising basic Marxist ideas, in laying the foundations of organized peasant and trade union movements, in establishing the idea that social revolution cannot be made without a revolutionary party, and in creating a viable Communist Party, however weak. 2. The Marxists have been the only consistent propagators of rationalist and humanist ideas in India. Here, they have tried to make up for the absence of a genuine and widespread and committed liberal bourgeois movement of rational and humanist thought. In addition, they have fought for genuine secular ideals, which rise above the unscientific and syrupy Hindu-Muslim bhai-bhai outlook. 3. They have contributed most to the wide propagation of that internationalist outlook which has been to an extent characteristic of Indian politics since the 1930s. Even the errors in the application of the notion of People’s War from 1942 to 1945 and the resulting heroic facing up to the widespread popular nationalist hostility had this aspect: it revealed the Marxist commitment to internationalism. Increasing weakening of this commitment since the 1950s has of course to be noted. The rest of the article is a serious criticism of the thought and activities of the organized Indian Left. Going by the passage quoted above, should this article have been considered a standard Left-bashing exercise and dismissed? The article should have provoked a dialogue, not a dismissal. Instead, Bipan began to be dubbed as a ‘Congress historian with a Marxist footnote’ and a ‘bourgeois historian’. This was simple denigration and I do not know how Bipan took it. It should however be added here that unsympathetic Left-bashing was quite common those days and Bipan’s criticism of the Left may have been clubbed along with the standard Left bashing. Still a distinction should have been made between a healthy though severe criticism and vicarious Left-bashing. Bipan’s was the former. In the year 1986, there was an interesting panel discussion in Teen Murti library on the nationalist movement in the 1930s. E.M.S.Namboodiripad and Bipan Chandra were the only two speakers. The combination was heady and stimulating. One was a Leftist practitioner of politics, active in the 1930s. The other was a Leftist historian, increasingly disillusioned with the organized Left. And the two had been good friends in the past. Namboodiripad was very fond of Himachali dish Madra (Rajma prepared in a particular way in Himachal Pradesh). When he visited Bipan’s house, Usha (Bipan’s wife who passed away in May 2009) would make Madra for him. At the panel discussion, Bipan spoke first. His position was stated clearly and lucidly: nationalist movement in the 1930s retained an open-endedness. It was still in a melting pot and it should have been possible to turn it in the leftist direction. The Left however made a mistake in not trying hard enough. An ideological transformation of the Congress and of the nationalist movement was still possible and on the cards. The Left should not have abandoned it but transformed it from within. It was a case of opportunity surrendered. After Bipan had finished, it was Namboodiripad’s turn. He spoke not so much as a professional historian but as a practitioner of politics during the times under scrutiny. He was there and saw it all. The transformation of the kind Bipan was suggesting was simply not possible. Patel and Rajendra Prasad had prevailed upon Gandhi and that had sealed the fate of the Left within Congress. Bipan was speaking on the basis of sources and record. Namboodiripad was a source and record himself. The encounter was very instructive and summed up the position well: Bipan was not anti-Left but disillusioned with the organized Left. A more meaningful dialogue might have moderated Bipan, but would certainly have brought the two closer. That unfortunately was not to be. Bipan continued to evaluate Congress not as it actually was, but for its objective historical role in independent India. Given the Left’s aversion to Congress, Bipan became a persona-non-grata for the Left. Through the late 70s and 80s it remained a troubled relationship. 5. Indian Society after 1947: The next major intervention by Bipan was on the nature of Indian society in independent India. It was almost inevitable that during the 1990s and 2000s Bipan should have turned to independent India. He had retired from JNU and was no longer teaching history to students. The historical questions that engaged him always had a ring of contemporaneity. And so, Bipan, along with his students and colleagues – Mridula and Aditya Mukherjee, turned to a systematic scrutiny of politics in independent India. And here also Bipan chose his sources very carefully and then relied upon them. Just like Gandhi had been his ‘Guide’ during a tour of the nationalist movement, for independent India, it was Jawaharlal Nehru. Bipan paid great attention to Nehru and concluded that Nehru had embarked upon the historically unprecedented task of promoting economic growth within a parliamentary democratic framework. This was a unique Nehruvian practice which needed to be theorized upon. Just like Gandhi had practised his strategy during the nationalist struggle without theorizing it, so had Nehru practised his model in independent India without theorizing it. On the whole his appraisal of independent India was that it was a vibrant and dynamic society, not a static one. It had many accomplishments, but lots more needed to be done. Bipan’s (and also of Aditya and Mridula Mukherjee’s) appraisal of independent India was in a way an extension of his approach to the nationalist struggle. He clearly saw independent India as a product of the nationalist struggle. The administrative apparatus of independent India (bureaucracy, army, laws) was derived from British colonialism. But the ideological apparatus (making of the Indian nation, democracy, mass participation in politics, civil liberties, foreign policy, etc) was built almost entirely on the foundations created by the nationalist movement. It was almost as if the nationalist movement had cast its shadow ahead of itself. Bipan’s positive appraisal of independent India was partly a response to an unsympathetic and dismissive treatment meted out by some of the foreign commentaries on India. Perhaps negligent of the complexities involved in transforming a huge and plural society like India, with long continuing traditions and two centuries of colonial rule, some of these commentators took recourse to denigration while describing Indian society. Obviously unhappy with this portrayal, Bipan set out to showcase the accomplishment of the Indian society after 1947. After writing the last two books on independent India, India After Independence (co-authored with Mridula and Aditya Mukherjee) and JP Movement and the Emergency, Bipan became a lot less active intellectually. He still met his students regularly, discussed various themes with them and encouraged them to write more and work harder. His own personal writings virtually came to an end, given his bad health and deteriorating eye-sight. With old age, he became more and more nostalgic about his lived life and wanted to share it with a larger audience. He thus started writing his memoirs towards the end of the decade. His method of writing his memoirs was quite characteristic. He would sit with his close students and tell them chronologically about his childhood days spent in Kangra, early student days in Christian Foreman College in Lahore, the three years spent in Stanford University in USA, lectureship at Hindu College, the shift to University of Delhi and finally, the move to JNU. As he spoke about his life, various facets virtually got organized as chapters in a book. He also added an extremely moving, personal and romantic chapter on Usha, his wife, how they met and spent their life together. Predictably, JNU occupies the largest space in his memoirs. After a particular narration was over, we asked him questions and he relished answering them, as always. I personally discovered that he had an amazing memory. In particular he remembered his interactions with his students very well. As he spoke about his students, you couldn’t miss the joy on his face and pride in his tone! His memoirs, when they are published will tell a story of Bipan’s life but also the times he lived in. It’s a wonderful story, narrated wonderfully. The last published piece he wrote was interestingly a pamphlet on the life of P.C.Joshi, the pioneering Communist leader. It is a pamphlet written with fondness and admiration. Bipan’s deep entanglement with the Left never quite left him. How does one define this relationship? Was it a love-affair gone sour? Or a mutual love-hate relationship? Or a peculiar entanglement in which both the sides attracted and repelled each other at the same time, and after a while you couldn’t really distinguish one from the other? Bipan paid his compliment to the Left by writing his final piece on P.C.Joshi. Bipan was also paid a compliment from the Left. At an informal and friendly meeting held in December 1997 to celebrate Bipan’s 70th birthday, Mohit Sen, a quintessential Communist and a friend of Bipan, paid what I thought was the nicest possible compliment. He said: “As a communist I thank Bipan for giving us back our own freedom struggle.” At the party many nice things were said to Bipan but I know for a fact that he enjoyed this one the most. Looking back, how does one make an assessment of all that Bipan said, did and wrote? During the last two decades and more, a whole paradigm shift has occurred in the writing of Indian history. The change is not simply in degree or in kind. It is much more pervasive and fundamental. The perspectives, the building blocks, the vantage points and the cognitive grounds on which we stand have all undergone a metamorphosis. Where do Bipan and his writings fit into in this new cognitive universe? At a superficial level it may look like the writing of modern Indian history had moved on, leaving Bipan behind. Indian nationalist movement does not quite evoke the same interest; Colonialism has become a thing of the past; Communalism has been neatly re-arranged in a different conceptual box called “Identity Politics”. And of course Bipan did not write anything of substance on caste, gender, and the environment. The focus on the big picture and the big questions appears to be over: the microscope has replaced the telescope; representation has replaced the phenomenon. What matter now are the social constructions of reality more than the reality itself. Can Bipan’s intellectual legacy be re-invented to adjust to the new challenges? That would neither be possible nor necessary. Bipan’s writings may not fit the new climate. But they essentially cater to the basic spirit of the Social Sciences, which is to make the human life, its encounters, activities, conflicts, relationships, institutions, changes and continuities, connections in time and space, more and more intelligible with the help of data and methods. This is the world of Social Sciences. This is the big picture that has remained intact. It is to this world that Bipan belonged and contributed. He was an important player in the game. He matters because of the way he played the game of trying to unravel the mysteries of the social world and taught hundreds of his students the same. The questions he raised still matter. And the answers he provided will keep finding enthusiastic supporters and vehement dissenters. Great tribute to a great historian.